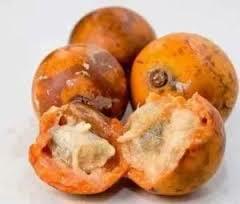 African star apple, also known as udara (Igbo), agbalumo (Yoruba) is an exotic fruit which have chewable edible skin that range in color from green to orange depending on the stage of ripeness. The tender sweet inner flesh is off-white with seeds making the inner part to look like a star-shaped fruit, which is where it derived it’s name. this is a seasonal fruit in Nigeria which comes out during November to March when it goes out of season. 1. African star-apple contains more vitamin C/ascorbic acid than orange. This vitamin helps to prevent scurvy (a mouth gum disease). 2. If you have Sour-throat, Constipation or Tooth-ache, why not try Star-apple. 3. According to research done in covenant university Nigeria, it was revealed that star-apple can lower blood sugar and cholesterol; it can also help to prevent and treat heart disease. 4. The other parts of the plant like roots, barks, and leaves posses great healing ability to cure cough, yellow fever, high blood pressure and so much more. 5. The seeds can be used to treat skin infections. 6. It is also believed that consuming the fruit can also help fight cancer and diabetes. 7. It could serve as a natural source of anti-oxidant boost to remove free radical from oxidative stress disorders. 8. It helps to lose weight, they fruit contributes 3g of fiber to the recommended daily intake of 25 to 38g. Fiber provides bulk to your diet, a factor that make your stomach feel fuller for a longer time. This can keep you from eating too much, and helps you lose weight.